It is a great pleasure to be back to campus, especially to be invited to one of the best universities in Britain! I want to congratulate Bristol in its recent QS global ranking of 28th place as a leading university of the world. When talking about higher education, people tend to compare British universities with their American cousins. For example America has the Ivy League while Britain has the Russell Group. America has Harvard and Yale while Britain has Oxford and Cambridge. Yet we should not forget that America also has MIT. So far I have visited more than 20 British universities and talked a lot about China, Chinese diplomacy and China-UK relations. Yet this is the first time I have spoken on China-UK educational exchanges. I will start from education in China. China is a five-thousand-year old civilisation. One of our cultural traditions is to stress education and respect teachers. The most famous ancient Chinese educator is Confucius. Legend records that Confucius had three thousand disciples and students. Unlike universities today, Confucius did not charge expensive tuitions. Students only needed to present him with gift as a token of respect. You might be interested to know what was the gift. According to ancient books this gift was 'ten pieces of cured meat'. This would be unimaginable in our time! · Teaching methods to match the aptitude of each individual student. · Teaching by using approaches involving patience. · The technique of learning new knowledge by going over what has been learned. · And learning by analogy and through inferences. These ideas have exerted a far-reaching influence on education in China and around the world. For a long time, China has been a strongly book rich, literate and technological civilisation. The evidence is how China gave humanity many key inventions such as gunpowder, paper, printing and the compass. Despite the proud traditions, China's education also went through some twists and turns. The main problem was it focused so much on morals and credos that it neglected science and training of practical skills. This narrow focus was especially the case during the Ming and Qing dynasties. In those times, education was reduced to a tool for passing exams to recruit government officials. The status of officials meant there was immense competition to pass the exams. However, the curriculum for the exams was useless in practical daily life. Literati and officialdom were indulged in playing with words and formats. The approach turned a blind eye to what was happening in the real world. As a result the government of China utterly failed to move on with social and technological changes. As China's education declined along with feudalism, Europe was vigorously pursuing the enlightenment of science. Countries like Britain became keen to educate the wider population through opening more universities. Then came the sad chapter of Chinese history when the door of China was forced open by the gunboats of Western powers. Consequently Western civilization was gradually introduced to China. In China the rise of the 'New Culture Movement' in the early 20th century spread the ideas of science and democracy. Chinese people were greatly stimulated by these influences and this resulted in China's educational system being dramatically reformed, especially after the founding of the People's Republic in 1949. Step by step, China's education became compatible with the rest of the world in terms of what to teach and how to teach. This education transformation has been integral to one of the greatest changes ever seen in human history. The past three decades has seen China emerge as the world's biggest exporter and rank as the second largest global economy. These changes were driven by the reform and opening up policies. The result is that China has made remarkable achievements on economic and social fronts. · Adult literacy rates in China are now at 99.3%. · Chinese people now have nine years compulsory education. · Enrolment at universities has passed 30 million places and this figure is the highest for any country in the world. · Higher education is open to the mass of people and far beyond a small elite group. · In 2012 China for the first time reached the target of investing 4% of GDP in education. · China has also engaged in multi-tiered, wide-ranging and all-dimensional educational exchanges with foreign countries. · We have introduced to China overseas intellectual and educational resources. · We have learned advanced international educational philosophies and experience. · We have improved the quality of educational exchanges and cooperation with other countries. · In 1850 one of the first Chinese students studying abroad was Huang Kuan. He came to study in Edinburgh University and won a doctor's degree in Medicine. He later became a medical specialist and educator. · The seminal figures in the development of the modern Chinese navy also studied in Britain. · The founder of China's semi-conductor technology, Huang Kun, studied here in Bristol University. He received a PhD degree from the HH Wills Physics Laboratory. He later won the most prestigious Chinese award in science. · The highly accomplished Chinese geologist, Li Siguang, studied at the University of Birmingham. · In 1957 Britain received the first group of government-funded Chinese students. · Since 1959 China has been offering scholarships for British students. 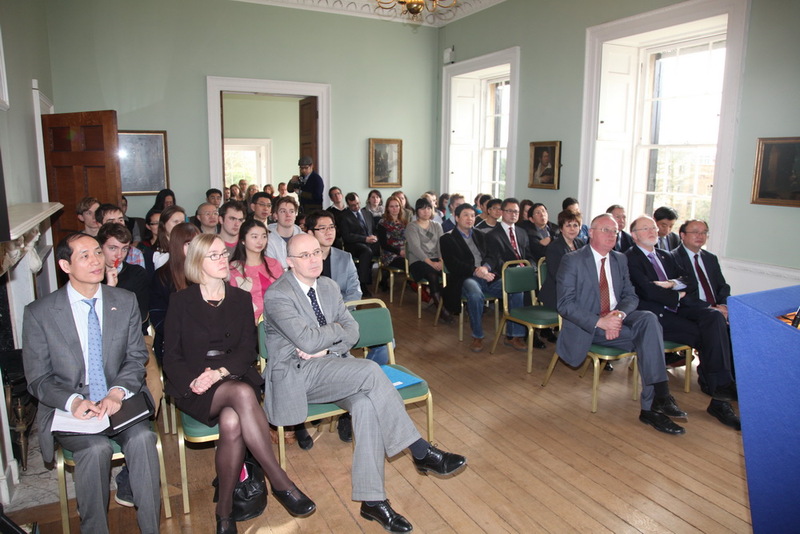 · Britain's Chevening program has run in China for 30 years. More than 3000 people have benefited from this program. In recent years, with the concerted efforts of both sides, China-UK educational exchanges and cooperation have been dynamic and productive. It is wide in reach and rich in content. The areas include higher education, primary education, vocational education and teaching of language and culture. There is strong support of both the Chinese and UK governments; but there is also active participation of educational and research agencies of various types and on various levels. The collaboration takes a variety of forms from personnel exchanges, joint programs to institutional building. The UK ranks third in the world as a country for attracting Chinese students. Currently, 120,000 Chinese students and scholars are studying in Britain. This makes Chinese students Britain's largest community of international students. This means in British universities one in every six international students is from China. 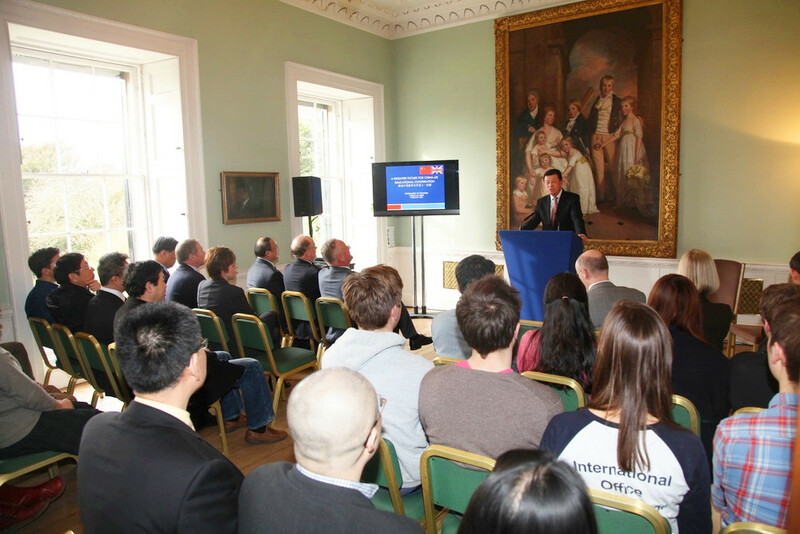 I am glad to learn that Bristol University is home to 2000 Chinese students. China and Britain are sharing a mutual trend in exchanging students. In recent years more and more British students are going to study in China. In 2012, 4250 British students were studying in China. This was an increase of over 20% compared to the previous year. British friends often tell me that despite the big gap between the numbers of our students in each other's country, the shares are more or less balanced when compared with our respective populations. At the annual dinner of Russell Group last year, I was the only foreign ambassador invited. This testifies to the importance British universities place on exchanges and cooperation with China. It was at that event that I had the pleasure of meeting Vice Chancellor Thomas. Now I am delighted to be his guest here in Bristol. These exchanges are symbolic of how we can proudly say that educational links have become a most dynamic part of China-UK relations. · Give top priority to education. · Take cultivation of character as a primary task. · Encourage reform and innovation. This Plan also set the target of realizing modernisation of education by 2020. The 18th National Congress of the Chinese Communist Party held late last year also stressed the importance of education. The Congress emphasised education is the cornerstone for national revitalisation and social progress. The government is determined to meet the people's demand for quality education. · We live in a time of globalisation. That calls for greater exchanges and cooperation. · All countries, big or small; all nations, strong or week, need to increase communication, understanding and cooperation. · Educational exchanges play an irreplaceable role in disseminating knowledge, dispelling misunderstanding, enhancing mutual trust and developing friendship. · Both China and UK have large educational programmes. Education has a long and important tradition in both countries. · We both have rich and quality educational resources. · For all these reasons we are well positioned to draw on each other's strengths and achieve win-win cooperation. In my view China-UK educational exchanges and cooperation should focus on the following areas. · We should support our universities to exchange teachers. There is a need to recognise each other's academic credits and award joint degrees. · Our leading universities should conduct joint teaching and research both in basic science and in high and new technologies. · We should encourage our vocational schools to enter into sustainable partnership, jointly develop courses and provide vocational training. · We should pair our middle and primary schools for two reasons. · It will strengthen hands-on ability of Chinese students and cultivate their independent and creative thinking. · It can also help improve the study of maths and science for British students. · We will as always support Chinese students to study overseas, especially in leading universities. · Of course we encourage students to return to China after completing studies abroad. We want them to help advance China towards developed country standards. · I hope British universities like Bristol will attract more and better Chinese students. I also hope they will become 'masters in their fields'. · At the same time China welcomes more British students to study in China. · To help British students we have formulated the Study in China program and worked out a series of supporting measures. These measures include mutual recognition of academic credits, short-term scholarships and teaching more classes in foreign languages. · I hope these measures will make it easier for British students to study in China. · We should support our best universities and educational institutions to set up educational and research facilities in each other's country. 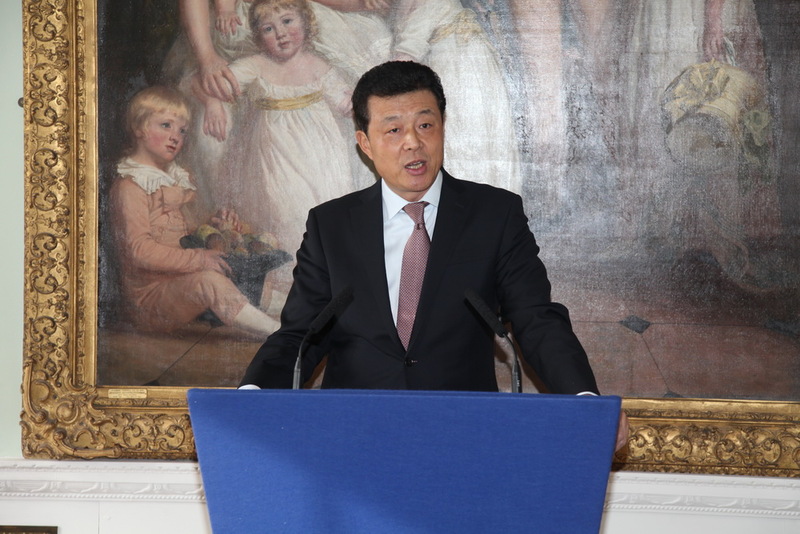 · China wants to import more fine educational resources from Britain and other foreign countries. · We will also explore suitable forms and ways to open schools in Britain. · 300 million people in China studied English. · This is more than total English speaking population in the US. · English is a compulsory course in Chinese primary schools, middle schools and universities. Chinese students usually do well in exams. But their English listening comprehension, speaking and writing are poor due to limited practice. · So, we welcome British language schools to recommend bespoke teaching methods in China. · In Britain the enthusiasm for learning Chinese is also growing. As evidence 23 Confucius Institutes and 66 Confucius Classrooms have been opened in Britain. · Chinese language has become one of the seven foreign languages for British students to choose in their compulsory language course. 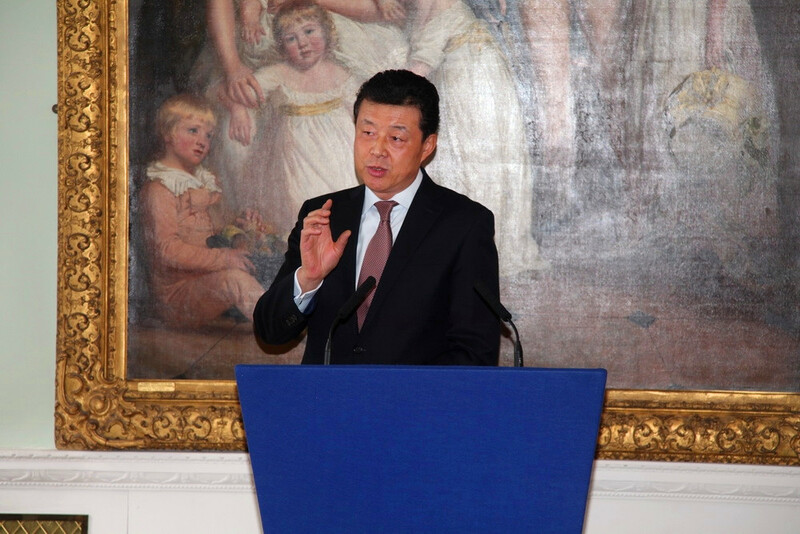 · In the future China and UK should continue to support the development of Confucius Institutes and Confucius Classrooms and improve their quality. · Meanwhile we should work together to strengthen the training of local Chinese language teachers in Britain. · In its process of modernization, China will draw upon experience of Britain and other developed countries. · We hope Britain will view modern China's progress and development in an objective and reasonable light. · In particular we hope British universities will lead this effort. Dozens of British universities have founded China Research Centres or China Institutes. · I do hope Bristol University will integrate resources, intensify studies of contemporary China and play a bigger role in promoting better mutual understating between China and UK. In the case of China-UK educational exchanges, we already have both strength and intelligence. So I am convinced so long as we make continuous efforts together, we will unlock our potential. In this way we will bring benefits to both countries and create a brighter future for China-UK educational cooperation.